The Madison Park Chandler Comforter Set provides a peaceful update to your bedroom with its soft shades of seafoam and taupe. Several geometric prints adorn this collection working together in large and small stripes for an updated traditional look. Comforter material is thin and shiney and the whole thing seems to lack in stuffing and I doubt it will fair very well in the wash. Colors are nice and as depicted and the pillows are cute and we'll made though. Wouldn't recommend but don't Wang to bother sending it back. Maybe I'll put it in the guest room but quality wise not up to snuff for the master bedroom. This is a nice set; including the pillow shams and the three decorative throw pillows. The colors are what I expected from the website photo. Good value for this set! Rich quality, gorgeous elegance. Thick and comfortable fabric. The colors are pale taupe, white, silvery hints, and a pale, pale turquoise green. This is a nice set. I just put it on the bed so we'll see how long it lasts. This comforter set is the one that has made me happiest. It is well constructed and no loose threads. What looks like pieced fabric is actually one piece with horizontal patterns. This is a really lovely comforter set. It doesn't look like something your grandmother would have ready in a guest bedroom. The colors and patterns are soft, comforting and inviting. I really like it. It adds a lot to the room for being so subtle. I chose this set after searching stores and other sites for two weeks, in search of the perfect comforter set for our Guest bedroom. I am so happy with this choice! It lends a very tranquil feeling to a room where we wanted to create a peaceful environment with undertones of the ocean, and sky. 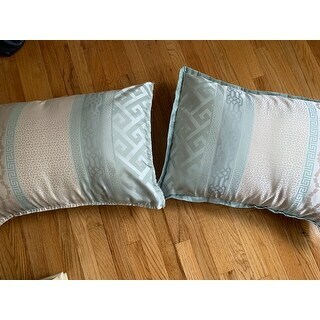 The set is high quality and has nice soft colors that pick up other accents in the room of more vibrant teal. I highly recommend this set! I love this comforter! It is very elegant but very warm.the colors are so soothing and pretty. I specifically bought this because, in the pictures, it appeared to be a soft blue and cream, but really it is more of a sea glass. I like sea glass, but it was not what I wanted in this instances. Also, I ordered a king, bit if you have a thicker mattress, as I do, it may not be large enough. I kept it and put it on the queen bed in my daughter's room. 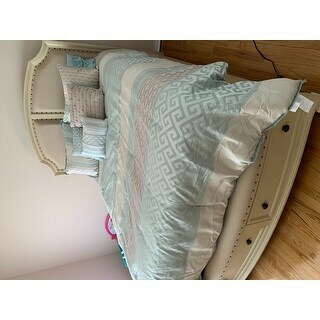 I gave 3 stars because the quality of the other Madison Park bedding sets I have purchased has been very good, so I have no reason to think the quality of this one should be different. Wasn't exactly what I expected. The colors were slightly different than the picture, but still looks great! this comforter set is very beautiful and chic with the white bed panel. Excellent quality. Looks and feels great! The material on top is too slippery for me, but others might like it. It is a nice set; the pillows that come with it match very well. I would only recommend it if my friend could see it first. The bed set itself is absolutely beautiful but I am giving it 3 stars because one of the pillow cases came without the border sewed on. I contacted overstock and they are providing me with a replacement but it was a very strange detail to be missing. But I love the print and color and overall am satisfied with my purchase. To shinny and as thick as it looks on the picture. Very pretty set. This works perfectly for our guest room and the colors are spot on. I was looking for soothing spa like neutral shades and this fit my idea for what I wanted. Nice quality. The fabric is just a bit stiff, but the look is worth sacrificing a softer feel (for me). This is so pretty! I just love this set. I have several Madison Park sets and they do not disappoint. Of course I wish the comforter was longer, but it is sufficient. It is way prettier in person. I did have a black mark on the comforter when I received, but this was not from Overstock. Overstock did make it right. I would definitely purchase again. Beautiful colors easy care. Looks exactly as advertised. Beautiful set! Just what I was Looking for! It looks just as nice as the pictures (except it was a bit wrinkled in packaging) Very soft and nicely sized on our Queen bed. Would buy it again. Thanks, Overstock! "Is the color Aqua or soft blue? I am looking for a soft greyish blue." "I think my monitor is pretty accurate with displaying colors, but for some reason I do not see the green that is mentioned for this set. I DO see the blue or aqua shade but the other looks taupe or in the beige family; not green.? Can someone please clarify for me? Thanks for your time =)"
It is blue and a taupe color. They say "Aqua", but it is much more of a blue than aqua. There is no green. It looks very similar to the monitor. The confort set is blue and taupe exactelylike a picture. There is no green. The set is beautiful! The colors pictured are accurate. There is no green in it. I bought the queen size for a queen mattress, but probably would have preferred king as I usually buy king size. I have it on a white bed with off white walls in a room with sliders overlooking the ocean. Just perfect! "The description for this set says it is Aqua. I have viewed it from more than one place and it appears ble, not Aqua. Please let me know which color it is. " Hello Suwel, we try to represent the colors of our products accurately. Unfortunately, due to the difference in monitor colors we cannot guarantee that the color will match exactly what you see on your screen. In my opinion this comforter set does not have any grey in it. Thank you for shopping with us. Perfect design details and colors.